Wall Street tumbled again on Oct. 23 as investors worried that the global economy is poised to weaken even as parts of the credit market slowly show signs of recovery. The major indexes fell more than 4 percent, including the Dow Jones industrial average, which finished off its lows with a loss of 514 points. Corporate profit forecasts, a jump in the dollar and falling oil prices signaled investors are fearful that an economic slowdown will sweep the globe even if lending begins to approach more normal levels. The dollar hit multiyear highs against several other major currencies, weighing on commodity prices. That hurt raw materials and energy companies, while giving a boost to airlines. Technology shares fared better than the broader market following quarterly reports from Apple Inc. and Yahoo Inc. While reduced strains in global credit markets have eased some investors' nervousness about the economy, market anxiety remains as hundreds of companies this week report third-quarter results and issue somewhat murky forecasts that are stirring unease about the economic bumps that may lay ahead. Wachovia Corp., which is being bought by Wells Fargo & Co., reported that it swung to a huge loss in the third quarter while the drugmaker Merck & Co. said its quarterly profit fell 28 percent and that it would cut more than 10 percent of its work force. John Thornton, co-portfolio manager at Stephens Investment Management Group LLC in Houston, said investors' fear has shifted from the immediate concerns about tightness in credit and the resulting difficulty in borrowing to the broader economy as companies come out with their quarterly numbers. "Even if it weren't for the credit crisis we'd probably be looking toward a pretty tough recession anyway," he said. "The third-quarter earnings are kind of uninspiring but third quarter hasn't been the real concern of people. I think the concern is the depth and duration of the downturn and the effect it's going to have on earnings." According to preliminary calculations, the Dow fell 514.45, or 5.69 percent, to 8,519.21, after being down as much as 698 points in the final half hour of trading. Still, the Dow finished above its Oct. 10 closing low of 8,451. The Dow fell 231 points Tuesday after jumping 413 points Monday. Broader stock indicators also fell Wednesday. The Standard & Poor's 500 index lost 58.27, or 6.10 percent, to 896.78, its lowest close since it finished at 892 on April 21, 2003. 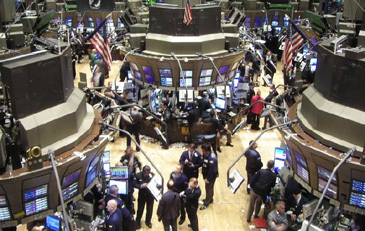 The technology-heavy Nasdaq composite index fell 80.93, or 4.77 percent, to 1,615.75. Light trading volume and the Dow's snapback — a rebound in the final 20 minutes that left the blue chips 183 points above the session's low — indicated that the trading was more orderly than it had been two weeks ago when waves of selling pounded the major indexes. "I'm not as concerned about a pullback in the market when you have light volume," said Dave Hinnenkamp, chief executive KDV Wealth Management in Minneapolis. Meanwhile, credit markets showed improvement after virtually freezing up in the past month. Bank-to-bank lending rates fell sharply overnight, indicating that credit is becoming easier to obtain. The London Interbank Offered Rate, or Libor, on three-month loans in dollars fell to 3.54 percent from 3.83 percent, dropping for an eighth straight day. Demand for Treasury bills, regarded as the safest assets around, grew slightly compared to the previous day as economic worries led investors to shun risky assets in favor of government bonds. The three-month Treasury bill yielded 1.00 percent, down from 1.07 percent late Tuesday. The levels are a notable improvement from the 0.20 percent seen last Wednesday, when investors were willing to take the slimmest of returns in exchange for a safe place to keep their money. The yield on the benchmark 10-year Treasury note, which moves opposite its price, fell to 3.60 percent from 3.74 percent late Tuesday. The dollar was sharply higher against other major currencies, while gold prices fell. "We're making slow progress and confidence is returning but we're still not there yet," said Christopher Cordaro, chief investment officer at RegentAtlantic Capital LLC in Chatham, N.J. He said the latest batch of quarterly results, which cover results through Sept. 30, don't reflect the full brunt of the credit freeze-up felt this month and the nervousness among some consumers following the stock market's swoon. While he expects corporate results will continue to worsen, he also said the markets remain "in panic mode" and investors are perhaps being overly dour in their assessment of how the economy will perform in the next few years. "When you look at the fundamentals of equities around the world, stocks are selling for very cheap prices," he said. "Behaviorally people project today's current bad news much further out into the future than they should." Worries about the global economy helped the dollar. The greenback rose against currencies like the British pound and the euro as investors worried about sluggishness in overseas economies. The strong dollar helped drive down the price of oil, as did a government report that U.S. fuel supplies rose last week. Light, sweet crude fell $5.43 to $66.75 a barrel on the New York Mercantile Exchange, after falling as low as $66.20. Aluminum producer Alcoa Inc. fell $1.63, or 13.4 percent, to $10.52 as commodities lost ground, making it the steepest decliner among the 30 stocks that make up the Dow industrials. Miner Freeport-McMoRan Copper & Gold Inc. fell $5.82, or 17.8 percent, to $26.92. Energy issues fell as oil slid to its lowest level in 16 months. Exxon Mobil Corp. fell $6.93, or 9.7 percent, to $64.57, while Chevron Corp. fell $5.06, or 7.6 percent, to $61.74. The decline in oil helped airlines. JetBlue Airways Corp. rose 2 cents, or 0.40 percent, to $5.01, and United Airlines parent UAL Corp. rose 85 cents, or 6.2 percent, to $14.65. In corporate news, AT&T Inc. said its third-quarter earnings rose 5.5 percent but missed analyst expectations in part because of strong sales of iPhones, which the carrier subsidizes. The stock fell $1.95, or 7.6 percent, to $23.78. Wachovia fell 38 cents, or 6.2 percent, to $5.71 after reporting its results. Merck slid $1.96, or 6.5 percent, to $28.01. Some tech names advanced. Apple rose after the company reported a 26 percent increase in its fiscal fourth-quarter earnings. The stock rose $5.38, or 5.9 percent, to $98.87. Yahoo reported a 64 percent drop in third-quarter profits but said it would cut at least 1,500 jobs, cost-cutting that appeared to please investors. The shares rose 32 cents, or 2.7 percent, to $12.39. Thornton said the latest corporate forecasts are difficult to rely on because companies are grappling with many of the same unknowns that investors are struggling with, primarily the extent of weakness in the economy. "These markets are making it difficult to gauge how much to read into management comments because clearly they're dealing with unprecedented change in fundamentals. It's hard to take their word on their outlook," he said. Declining issues outnumbered advancers by about 5 to 1 on the New York Stock Exchange, where volume came to 1.56 billion shares. The Russell 2000 index of smaller companies fell 28.68, or 5.40 percent, to 501.97.